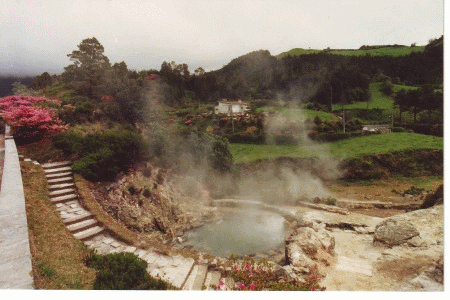 Furnas is a must see on any trip to San Miguel. 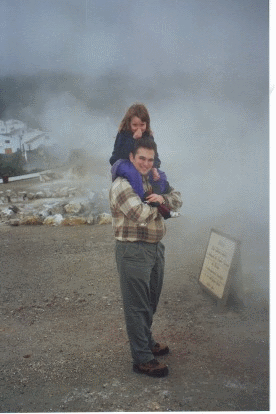 So when I took my daughter, Mandy, to the Azores for her first trip in February 2000, we stopped there. The Azores weather in February is usually around fifty-five degrees fahrenheit and damp. This day fit that description exactly. It was cool, cloudy and damp thanks to the humidity in the air. The Caldeiras, on the other hand, were hot. Boiling hot as usual. I explained to Mandy that the Caldeira's were boiling because of the volcanic activity under the ground. She seemed to think it was cool. But she asked why it had to smell so bad. You see, there is a bit of a sulfuric odour if you are standing in the steam from the Caldeiras. She enjoyed sitting on my shoulders in the steam while plugging her nose. She enjoyed the warmth of the steam and thought it was amusing making me stand there. In the next picture you can see one of the Caldeira's that was making all the steam. You can also see that even in February the landscape is a lush green and there are flowers in bloom. No matter what time of year you visit San Miguel this is a great place to explore.